thePHPfactory brand was created in 2006 by our mother company SKEPSIS Consult SRL, a well-established and successful business in the IT field as a software development house, who started its activity back in 1993. Being primarily involved in Mambo Extensions Development, the Company thought to create a new brand, representing the Web Development field and more particularly the Content Management System area. One of the first steps in creating theFactory brand was made in 2006, by acquiring some key promising solutions and developers from Softmarket Company, in order to expand our expertise and build even more intuitive and reliable products. For the following years, we boosted the CMS World, especially the Joomla! CMS community with very complex and professional extensions, saving users and web-masters a lot of time and money, by providing them stable and powerful applications, for the best price/quality ratio. Based on our components, we also started to offer customized solutions for small and mid-ranged enterprises, meeting even the most specific requirements. As a key player in the Joomla! Development Solutions, we started the expansion towards other CMS Solutions and stand-alone products in order to provide a wider palette of possibilities. When choosing a certain CMS solution, most of the web-masters base their decision also according to how many extensions are available within that community. Our motivation for success comes from constantly improving our products and the innate desire to maintain our professional relationships at the highest standards, which is why in 2014 we decided to change our infrastructure (integrated platform including web presence, ticket system, project management system and internal tools) in order to especially ease and enhance the customer support area and to abide by the rule that "less is more". Fortunately, our team is very versatile and due to our reliable infrastructure built over the last decade, we have the power to develop further, while not many other software houses can keep up the pace or can afford evolving. Most of the existing solutions, especially extensions around a free CMS like Joomla!, are simply developed over night or created as forks of older projects, where the life expectancy does not exceed six months. After that, most of the products are discontinued, or simply not being further developed or supported. This happens out of several reasons... One of them is the fact that a large part of the extensions providers are one-man companies and after a period of time, some are either loosing interest or they are finding a better way to make income. Of course, there are always special cases, like VirtueMart or CB developers, but these are just well known exceptions confirming the rule. Another disadvantage of unestablished 3rd parties is that when creating and maintaining a single extension or just some small plugins, there is a huge drawback regarding the generalization and compatibility to multiple platforms and configurations, due to picayune experience and limited staff cooperation. Since Content Management Systems are the future of every man on the web, we can really make a difference and extend a helping hand from our position as already one of the biggest CMS Solutions developer out there. Why us? Why choose our products? As a development company, we plan, develop and support our products through the complete life cycle of the CMS. 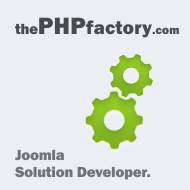 This can be seen on products like the Auction Factory, which, for around one year was under development and beta stages, then after its release seven years ago, we continued to develop it, offering not only the best extension for Joomla!, but the best PHP auction script on the market at an affordable price for everyone. By doing this we saved our clients from making significant investments of 5 digit sums to develop their needed platform. An important asset beside the high quality and flexibility of our products, is also the extension support we are providing. This amazed many of our clients who originally thought our support is just a plain statement. When they needed us, they were happily surprised to see a high quality standard and professionalism which is rarely encountered in business over the Internet. Last, but not least, as a software house, we create job positions for our staff, contributing not only on a professional level, but also on the economical and social one. When we embarked on this journey, we received a heads-up that investing in a Romanian business may not be the best of ideas. But we thought that by bringing over the German mentality, combined with the creativity experienced in Bucharest, one of the most interesting European capitals, we could achieve outstanding results for our customers... and the last couple of years are certifying it! We hereby express our gratitude towards all our customers for their trust and business support!